New numbers are coming in and I am looking over them. It looks like there could be some changes coming to the forecast for the next 36 hours. So far just the new run of NOAA's NAM model is in. Here is a look at the model data specifically for the Cape Girardeau, Missouri area. There are several things to look at with the above data. First, take a look at the precipitation that the model brings through. It starts the precipitation falling around 5pm CT Wednesday and ends the precipitation around 6am CT Thursday. Second, take a look at temperatures in the air column above us. Warmer air aloft begins to move in starting around noon Wednesday. The gray numbers at the right indicates the height in the sky. (4k = 4,000 feet) The warm air builds in through the afternoon and even drops down to around 1,800 feet by 2am Thursday. 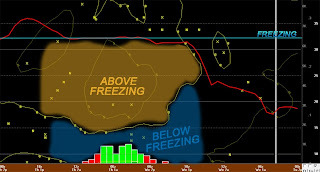 Under the layer of warm air there is cold air with a temperature below 32 degrees F. (The numbers listed on the yellow lines is temperature in Celsius.) With the cold air trapped at the surface, it provides an environment for any moisture to freeze. Third, take a look at the squiggly red line. The line indicates the temperature at the surface. The gray horizontal lines indicate the air temperature. I have drawn in the 32 degree line with a blue line. Temperatures through the day Wednesday should warm in to the lower 30's, but notice how the temperature holds steady Wednesday afternoon through Thursday morning. When looking closer at the data, it takes our temperature from 31.8 degrees to 32.7 degrees. That would mean temperatures will be flirting with the freezing mark. That is... if this model is correct. Computer models often have a very difficult time handling the cold air trapped in the lower thousand feet of the atmosphere. It often overdoes how quickly the cold air moves out. Here is my concern... Will the air temperature at the surface be below freezing? Two years ago when we had the mother of all ice storms, forecast models tried to warm up some of the area to above freezing. All day long the computer alogrithms, that try to determine where the rain/snow line is located on radar, were wrong over western Kentucky. For much of the day we were under the assumption that areas like Murray, Kentucky were seeing rain. It turned out they were seeing rain but the temperature at the surface was around 30 degrees so everything was freezing once it was on the ground. The models continue to indicate that we are going to see freezing rain initially but it will change over to rain late Wednesday night or early Thursday morning. BUT, ... Will this be the case? Now I should say again that this is NOT going to a major ice storm for the area.I should now remind you that this is NOT going to be a major ice storm for the area. I've told a few people that I went out over the weekend and bought a small can of deicer, not a gallon of deicer. I am thinking we will an initially burst of sleet Wednesday afternoon/evening and then it will change over to freezing rain. There could be some very light precipitation falling during the day, but I think the bulk of it will hold off until the evening. There could be a change over to rain but the key will be the air temperature at the surface. Amounts will generally range from 0.10" to as much as 0.2" of ice. Not everyone will see these amounts. I think areas north and northwest of Cape Girardeau will be less than 0.1" and the heaviest areas will be over western Kentucky and southeast Illinois. Again, this won't be like the ice storm from two years ago. That was catastrophic. This will be more of an inconvenience, especially for Thursday morning. What makes this forecast extremely difficult is the fact that this storm hasn't even developed yet. In an essence, forecasters are shooting at a ghost with a blindfold. Are there any uncertainties with this storm? Absolutely! All we have to rely on at this point is computer models. The upper-level energy that will form this storm is just moving onshore over the northwest United States. From this point going forward the computer models will be able to get a better grip on the storm since it will be over land. Things can still change with this storm and there is a chance this could just be a cold rain. Stay tuned to this blog and keep up to date on the latest forecast on my television station's website, www.kfvs12.com and watch Heartland News on KFVS12. Brian Alworth will be in Wednesday morning on The Breakfast Show from 4:30am to 7:00am. I will be in for Heartland News at Noon. Bob Reeves will be in for Heartland News at 5pm, 6pm, 9pm, and 10pm. If you aren't able to watch the news on your television you can watch it live on your computer by going to the website. You can also watch the news over 3G on your iPhone and some Android mobile devices by downloading the station's free app.